The BALLET GOLD is one of the all time classic rock shoes and one of the few remaining that is meticuoulsy hand crafted and board lasted - the other being the Boreal ACE. Board lasting is a process of wrapping the upper "cut" around a leather board, stitching it into place and then adding a mid-sole, sticky rubber outsole and finally, when the shoe is removed from the last - an insole. It is the most time intensive and expensive way to make a shoe, but many would argue the best. The resulting structure is supportive, durable and offers long term predictible performance... as well as the option for multiple resoles. The BALLET'S mid ankle cut adds further support for technical edging and also protection in fist and off-width cracks. To-the- toe lacing can be relaxed for twisting into cracks or snugged up for superb edging precision. Same tall sticky rubber and rands as the venerable ACE with 4.6 - 5.2 mm size graded sticky FS Quattro rubber under foot. 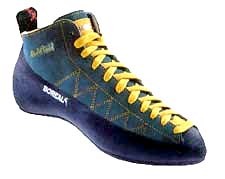 A great "free wall" shoe and good all arounder. Crafted in Spain, delivered world-wide. Fitting tip: if you wear a men's 10.5 US street shoe (UK9.5) order this size for comforatable crack climbing and long routes. I you want the ACE to be "stiffer" for standing on knobs and thin face holds go down 1/2 size to a UK9. Use the SHOE TOOL to clean and prepare your soles before each bouldering session or climb to help you stick to the rock like crazy. Use a little water and either soft nylon or stiff brass bristles to remove dirt and oxidized rubber. Edges can be tuned with sand paper, crepe eraser will keep uppers lookin' good. Leash hole in handle.